Heat oven to 450°F. Make and bake crust as directed. Cool completely on cooling rack. In 2-quart saucepan, heat caramels, butter and 2 tablespoons water over medium heat, stirring frequently, until caramels are melted. Pour into cooled baked crust. Sprinkle with pecans. Refrigerate about 1 hour or until chilled. In small bowl, beat cream cheese and 1/3 cup powdered sugar with spoon until smooth. 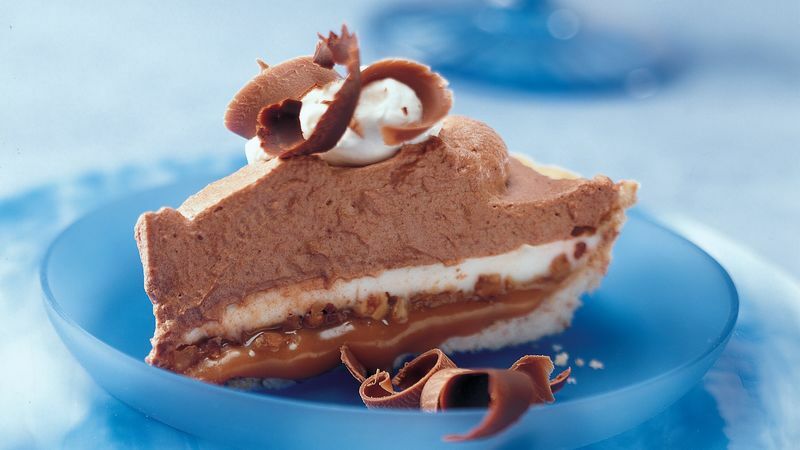 Spread over caramel layer; refrigerate. Meanwhile, in 1-quart saucepan, heat chocolate and 3 tablespoons hot water over low heat, stirring constantly, until chocolate is melted. Cool to room temperature. Stir in vanilla. In chilled large bowl, beat whipping cream and 2 tablespoons powdered sugar with electric mixer on low speed until mixture begins to thicken. Gradually increase speed to high and beat until stiff peaks form. Reserve 1 1/2 cups. Fold chocolate mixture into remaining whipped cream. Spread over cream cheese layer. Garnish with reserved whipped cream and chocolate curls. Cover; refrigerate at least 1 hour until firm but no longer than 48 hours. To make chocolate curls, let block or bar of milk or semisweet chocolate stand at room temperature about 15 minutes. Pull swivel vegetable peeler or thin, sharp knife across block, using long, thin strokes. Use a toothpick to lift curls and arrange on the dessert. * To toast pecans, heat oven to 350°F.Spread pecans in ungreased shallow pan.Bake uncovered 6 to 10 minutes, stirring occasionally, until light brown.